I’ve lived in my development for over 20 years and our house was built several months before any of our neighbors. We’ve never had any problems and we speak in passing, but no one has ever said, “You’re a good neighbor”. 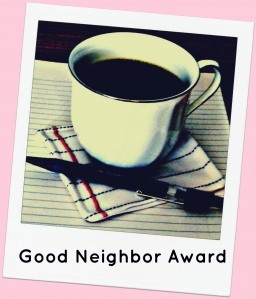 I started my blog 8 months ago and to my great surprise was recently nominated to receive a “Good Neighbor Award”. Saturday morning en route to Dover, I received an email from the award’s sponsor, Katherine of Pilowsalamode, and got so excited, joyously telling my son. He was not impressed, looked at me like I had 4 heads and kept on driving. The excitement grew as I read more, it wasn’t just the award, I along with others was nominated anonymously by fellow bloggers and their comments were so heart felt and touching. Each morning, I will get a cup of coffee and visit the blogger neighborhood reading and meeting my virtual neighbors. I want to thank Katherine for sponsoring the award, thank and send a great big HUG and SMOOCH to the person who nominated me and congratulations to all the award winners.